I graduated from college two years ago with a degree in jazz studies and an emphasis on piano. I’ve spent the past two years basically working as a musician, discovering where I should take my musical interest. I’ve been working at churches, conducting choirs, doing a lot of classical organ music. I’m music director at a Lutheran church. I’m also a singer in a Celtic rock band with my family, MacTalla Mór. Two of my younger brothers play bagpipes and while I was in college studying jazz my mother got very into traditional Irish frame drums, so we all decided it would be nice to have an outlet to play music together. We brought to the table all the influences from the various directions we were coming from and created this Celtic fusion sound. We just started playing some small gigs, and in the past two years it really has taken off. We have three albums out, we’ve sold more than 2,000 copies of our first album, we’ve played Caesar’s Palace in Las Vegas, we’ve toured the Northeast and we’ve played at Grandfather Mountain Highland Games in North Carolina, which is the biggest Scottish clan gathering in North America. The band is a lot of fun. Our band’s genre definitely is niche. There’s this neat movement happening now where musicians are blending traditional Celtic music with more modern sounds such as rock, rhythm and blues, jazz and world music, and that’s really becoming very popular. I think what we’re doing is particularly unique because most bands don’t involve the keyboards or the organ, and they don’t have the mix we do as far as instrumentation. Homeschooling has helped. It has helped me think more fluidly, and see the world and meet people who have alternative lifestyles. I witnessed in college what institutionalizing music can do to some people; it can really close off certain paths of creativity because everything is so over-defined, especially in the classical fields. What I’m trying to do with my music is not define a musical genre. I’m melding and grabbing what I can. Everybody asks me what I’m doing now that I’m out of college. I tell them I’m in a band – with my parents. They think that’s so awful and they can’t imagine anything more odd than going out Friday, Saturday nights with my family. But I love my family and we enjoy spending time with each other! Homeschooling is a big part of why it works. My brothers and I really grew up together, whereas if we had been in school our schedules would have divided at such an early age that we probably wouldn’t have been as close, or as able to spend as many hours rehearsing together as we do. Our rapport is such that we’re used to spending a significant amount of time with each other. Many people my age seem to see family as just an event for holidays – something just to get through. Not us. Because we were homeschooled, we had no choice but to learn how to live and work together. We worked on our conflict resolution because we had to work on it, because that’s who we were relating to every day. Now we relate to each other much more as human beings, not as siblings or parent-child. I never saw my mom just as someone who helps me with schoolwork at night, for instance. I definitely recognize that there is an insular quality to my life, though. I live with my family, I studied with my family, I have a business with my family, I’m working with them – becoming almost codependent with them. There definitely are times when I feel it is extremely abnormal, and I think that I need to get out and get some breathing space. But that’s something people also have to face if they have gone to school. They just have to face it in a different way; they have to face being an independent individual away from their old friends. Everybody has his or her comfort zone. As a homeschooler, my comfort zone just happens to be blood relatives. I think if you recognize that there are certain downsides to your comfort zone, you can deal with it. I just have to think for myself and make sure I’m not being insular. The band is getting itself off the ground. They always say a business takes about five years to start and we’re not at the five-year mark yet; we’re still buying equipment and recording with the money we’re making. This year we’ve started making a decent amount of money, though, and hopefully it is just going to keep going. Everyone is trying to a make a living from the band, so we’re definitely working to make the business viable. I think it will be viable soon; we have a really decent fan base now and we’re playing one to two times every week. Making the choice to homeschool when I was younger has actually given me the courage to give music a try as a professional musician, in a band, with my family. Homeschooling is a mind- opening thing. The possibilities aren’t cut and dried, I’ve learned. For me, I don’t have to graduate from college, get my master’s degree and work a nine-to-five job. There are alternatives, like the band. But I do battle in my head with what I should be doing. Society says I should be pursuing a degree. Because I can get my master’s or go to law school, I should. Society says I have to make as much money as I can and have as big a house as I can. I definitely feel pressure. Right now I’m happy as a church musician and as a member of my family’s band, but a lot of people look at me and ask what else I am doing. There’s a status I’m missing. I’m not a businesswoman. I don’t have a fancy degree or a 401(k) – I don’t even really know what a 401(k) is! Right now, I’m trying to resist the pressure. I also think that homeschooling has helped me realize that there is no real rush in life. More than the career-woman pressure, there’s the pressure to rush and establish a life. I have to keep going to school and then get that job to make that salary cap so I can start my life, society says. I think one thing homeschoolers realize is that life has already started. You don’t have to wait until you’re done with high school; you don’t have to wait until you’re done with college to really experience life and learn and challenge yourself. So, I’m not really worried. If we go on the Tonight Show in a few years, that’s great. But if not, I’ll study law or English or musicology. There’s no rush. I don’t need to have it all figured out. Peter Kowalke grew without schooling. He is a journalist and the producer of “Grown Without Schooling,” a documentary about grown homeschoolers and the lasting influence of home education.This article was published in 2007. 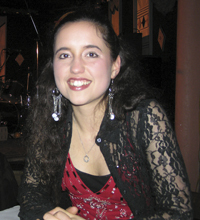 To listen to music from Ilana’s band, visit www.Mactalla.com.